The 921G provides more than 42,000 lbs of breakout force and an optional 5-speed transmission with lock-up torque converter provides faster acceleration and travel speeds up to 25 mph (40 kph). The CASE exclusive mid-mount cooling module allows all coolers to have access to cool, clean ambient air to maintain optimum operating temperature for the mechanical and hydraulic systems. Additionally, CASE’s SCR emissions solution offers unmatched fuel efficiency with no diesel particulate filters, no regeneration, and no extreme exhaust temperatures. Add to this ground-line serviceability – a hallmark of CASE – and you’ve got a powerful and efficient machine committed to increasing productivity and reducing downtime. There is much demanded of loaders in this size class, and CASE G Series loaders are built for heavy work and designed to do it efficiently. Optional heavy-duty axle options with auto-locking front differential, 5-speed transmission, ride control, and standard automated bucket controls such as return-to-dig, return-to-travel and height control all help achieve optimal cycle times and productivity. Four power modes help further dial in speed and power, and an electro-hydraulic, load sensing hydraulic system allows for improved functionality and precise bucket and loader functions. And with an SCR emissions solution, these models offer no downtime related to regeneration. CASE was the first to employ SCR technology in heavy earthmoving equipment – and G Series wheel loaders are the second generation of CASE wheel loaders to benefit from the fuel efficiency and cooler operating temperatures, which often compares to alternative solutions with diesel particulate filters (DPFs). No regeneration, no recirculation of exhaust gasses, no temperature spikes to burn off particulate – all ensuring that a greater percentage of fuel use is put towards productive work. 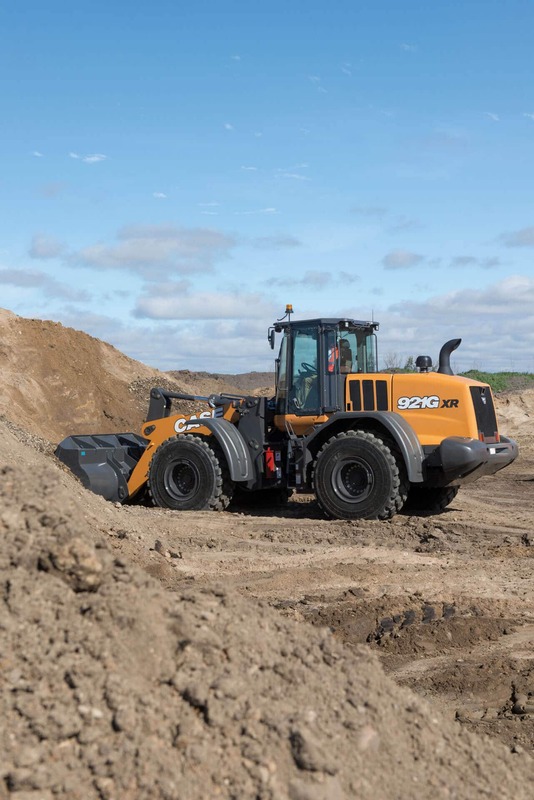 Matched with load sensing hydraulics that ensure the machine is only working as hard as it needs to, and operating modes such as ECO that provide greater fuel efficiency, and the G Series promises to be among the most powerful and fuel efficient wheel loaders on the market. The cab and operating environment of the G Series have been completely re-engineered to provide optimal operator performance, ergonomics and engagement with both the controls and the surrounding jobsite. 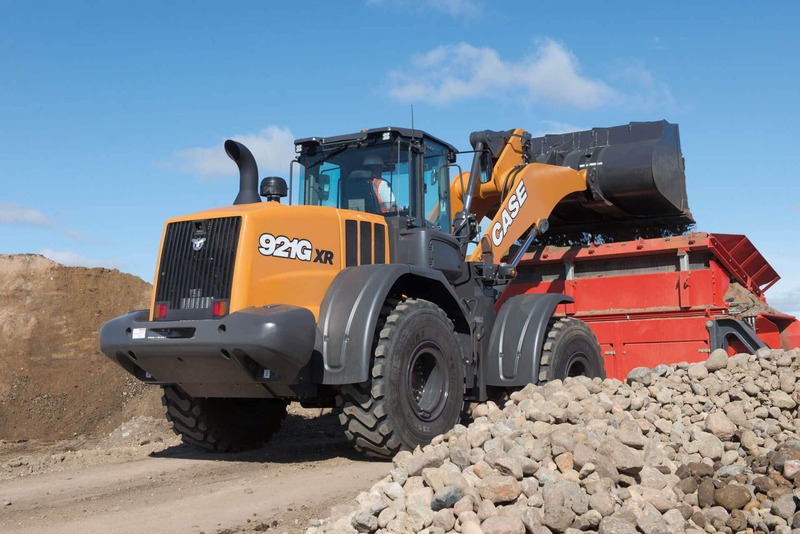 The cab has been designed to optimally accommodate a broad range of operator sizes, and a new 8" LCD monitor provides the operator with simple control and greater insight over many loader functions and activities. The latest in electro-hydraulic controls, numerous seat and adjustability options, and an all-new membrane keypad further simplifies operation and training. A new, one-piece rounded windshield and optimally placed mirrors, along with a rearview camera that feeds the new monitor, ensures full 360° visibility. An entirely new HVAC system ensures operators stay comfortable regardless of where they work. CASE G Series loaders offer a number of service-related features that help extend service life of the machine, lower operating costs and improve overall serviceability. The CASE-exclusive mid-mounted cooling module ensures access to clean and cool ambient air to keep all operating components cool, while also limiting debris buildup and providing easy access for routine cleaning. This unique design allows the engine to be pushed lower and towards the rear of the machine, improving balance and stability, but also placing all routine service and maintenance items within easy reach of the ground. Factor in CASE ProCare, and owners can more accurately predict all owning and operating costs for the first three years of ownership while getting all parts and labor provided by CASE in partnership with the local dealer. Recommended for applications on hard surfaces or with solid tires.